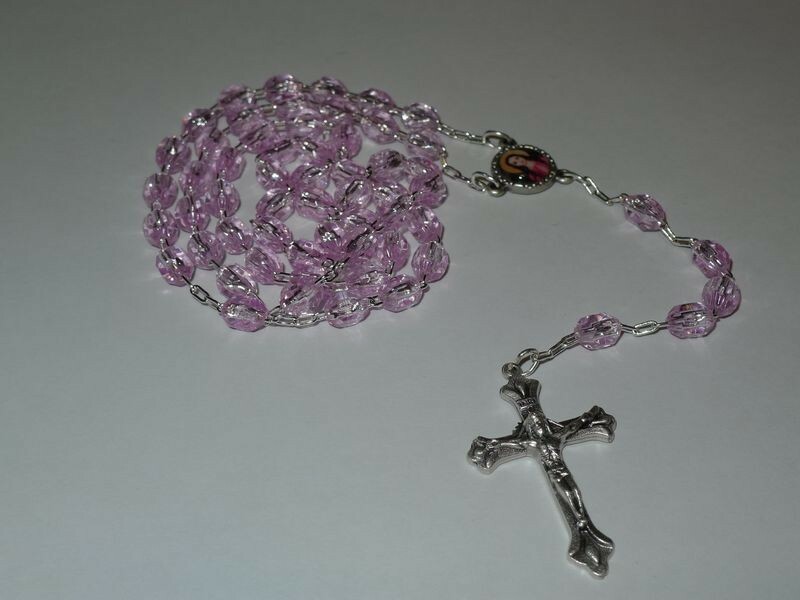 Beautiful pink glass Marian rosary beads with St. Philomena medal on them. Rosary beads, from the Latin rosarium meaning garland or bouquet of roses, is a string of beads and a crucifix. The Rosary begins with the Apostles Creed, followed by one Our Father, three Hail Marys (traditionally offered for an increase in faith, hope, and charity for those praying the Rosary), a Glory Be, and, if desired, the Fatima Prayers. Next come five mysteries, each consisting of one Our Father, ten Hail Marys, a Glory Be, and, if desired, the Fatima Prayers. Conclude with the Hail Holy Queen.